I Thought I'd Seen and Read it ALL! I thought I had seen and read it all, sideshows, carnival, circus annexes, but I was wrong. In the beginning life was simple, you went to a show to receive your cheap thrills and left. As time progressed competition slowly pushed the oddity exhibition from the stage. A new form of entertainment had taken over the silent movie, followed quickly by the talkies. The exhibition of human performers waned and was soon only a shade of what it used to be. Soon a whole batch of horror movies, featuring real or fake freaks of nature took over. Late 1980ies early nineties a new form of entertainment turned up, the so-called freak shows where a combination of theatrical performance and tests of human endearment was gathering large flocks of people. However this seems to have instigated a new interest, slowly the theatre scene became interested albeit not always things went well. A Dutch theatre group was banned from stages in Holland a couple of years ago when they transformed themselves into a freakshow, none of the artists involved were disabled but protestant Holland fulminated against it. A few months ago on, 24th of July I read an interesting article, though very brief and very shallow, in the Flemish newspaper "De Gentenaar" about Bataclan. It mentioned the story of a Siamese twin who had been separated at birth and now performed as a freak show, as you may suspect my interest was aroused. So I decided to leave the confinement of my house and visit Bataclan. According to Xavier De Cloedt, who runs the organization Cirq and is responsible for the Bataclan concept, and director Koen De Poorter, a writer and director of the odd theatrical and television show Neveneffecten, the main source of inspiration of Bataclan was the American HBO hit "Carnivale". In essence what they had recreated was a sideshow. They had been given a large open area right beside the ancient ruins of the Saint-Bavon abbey where they could set up their tents and caravans. This circular structure contained the sideshow. The square is dominated by Jesus, Jesus, where does he come in? Jesus is a bearded and long haired hippie-like dude wearing a white robe. This startling figure has an important role as talker. Continuously firing a mix of his hilarious one-liners to the public but also inciting the public to visit several attractions. However he's not alone, other attractions can be observed walking around the square, including two black clad ladies which seem to have escaped from a gothic or industrial party. These ladies look mean and vicious despite the fact that they advertise their massages which can be had in their trailer. Who wouldn't want to visit them....? There was also a caged strongman, who exercised on a home trainer before showing off his strength by pulling a small train filled with excited children, if you had given some of them a whip, the strong man would've been beaten to death. That's it for the walking attractions. Other attractions that could be visited were the seer Perdita petit beurre, a midget who uncovered her patients love live via the tarot, a feat not so uncommon because attractions like the Schaeffer and Lester's midgets already did this decades ago. A very cool attraction and very simple was the "freakshow" cabinet. A wooden contraption, the tent-o-vision, decorated with the images of human attractions of olden days, the visitor was invited to crawl under it and place one's head in the holes which were cut out underneath this large crate. Inside the visitors could see a miniature freakshow, with themselves as main freaks, quite simple and ingenious. Finally there was the smallest luna park where you could do several attractions on a very small area. Finally there were the shows in the tent. These were quite interesting because in essence they were slightly longer than all the other attractions. There were three shows daily. One of these featured the Belgian stand-up comedian Gunther Lamoot, in his incarnation of "Veronique"; according to a promotional flyer "Seer, Miracle man, devil-do-all, straight from Jan Bardi (Belgian magician and illusionist (yes we have these too), and a graduated horoscoper. However I only went to see one show "Armando and Benito", featuring the separated Siamese twins Armando and Benito. Everybody had been crammed in a small tent, all staring at a red curtain emanating from behind it were strange sounds. What was going on there, we didn't know, the audience sat there waiting and then it started. After the show the public left slightly estranged. What had happened, what did they see, check it out here. It was an odd experience, Bataclan, but strangely enough everything seemed to fit and the main thing one could see between the lines was that it was nothing more than a gang of hustlers bend on ripping the public off. Ripped of they were but they still got something for their money. 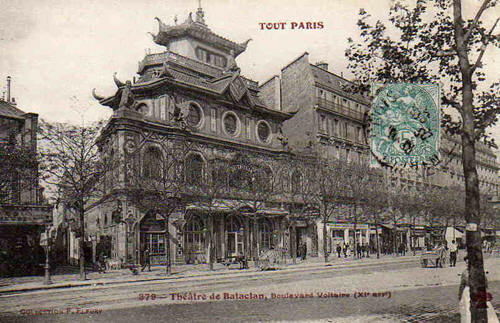 Were did the name Bataclan come from? Probably from Paris were the century old Bataclan vaudeville theatre is still in business. A friend of mine even used the expression "wat is dat hier voor een bataclan" "what is this here for a Bataclan" which means what kind of a scam is this. Oddly enough these two were flawlessly combined, the public was ripped off but it did get a complete vaudeville performance. Was I feeling ripped off, no not really though many people may have felt because if you did the whole experience then you would've lost a lot of money, the entrance was free but most of the attractions had to be paid for. This was a bit strange if you take into account that the organization had been subsidized by various organizations. However I suspect that these may not have been sufficient enough if you had experienced the event. Everything had been embellished to perfection.